Nirmalya Roy is currently an Associate Professor in the Information Systems department at University of Maryland Baltimore County. He directs the Mobile, Pervasive, and Sensor Computing Lab (MPSC) at the University of Maryland Baltimore County. He was a Clinical Assistant Professor in the School of Electrical Engineering and Computer Science at Washington State University from January 2012 to June 2013. Prior to that, he worked as a Research Scientist at Institute for Infocomm Research (I2R), Singapore from 2010 to 2011. He was as a postdoctoral fellow in Electrical and Computer Engineering Department at The University of Texas at Austin from 2008 to 2009. He received his Ph.D. and M.S. in Computer Science and Engineering from The University of Texas at Arlington in 2008 and 2004 respectively. 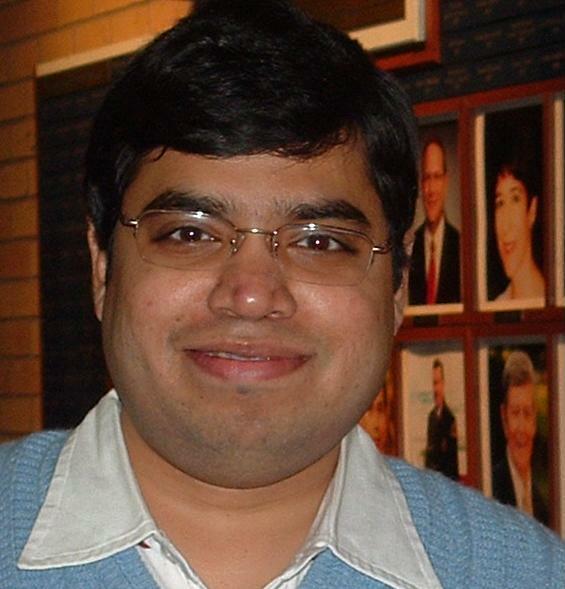 He did his Bachelors in Computer Science and Engineering from Jadavpur University, India in 2001. [June’18] Hafiz featured in HP Labs Summer Internship News. Well done! [June’18] Analyzing the Sentiment of Crowd for Improving the Emergency Response Services has received Best Paper nomination. Congratulations Neha! [June’18] 4 papers covering flash flood detection forecasting gas usage in large building have been accepted in SMARTCOMP 2018 conference. Congratulations Bipen, Neha, Amrita & Nilavra! [May’18] Hafiz is heading to HP Print Adjacencies and 3D Lab and Nilavra to T. Rowe Price Multi-Asset Research Division for summer internships. Enjoy your time in east and west coast! [April’18] Arif featured in UMBC Class of 2018 News Story. Congrats Arif! [April’18] UnTran: Recognizing Unseen Activities with Unlabeled data using Transfer Learning accepted in ACM IoTDI 2018. Congratulations Hafiz. [March’18] Scaling Human Activity Recognition via Deep Learning-based Domain Adaptation paper accepted in PerCom 2018. Congratulations Hafiz! [Jan’18] Dr. Roy is co-chairing a panel on Data Analytics on IoT: Applications, Impacts and Vulnerabilities on the workshop day at ICDCN 2018. [Jan’18] Dr. Roy is an invited speaker to ACM ComNet-IoT 2018 workshop. His talk is on A Cross-Domain IoT Framework for Human Activity and Behavior Recognition. [Jan’18] Non-Intrusive Air Leakage Detection from Residential Homes accepted in ACM ICDCN 2018. Congratulations Nilavra! [Dec’17] Firearm Detection Using Smart wrist band work accepted in WristSense 2018 workshop with PerCom 2018. Congrats Hafiz & David! [Nov’17] Arif successfully defended his PhD thesis. Arif will be starting a Research Staff Member position at MIT-IBM Watson AI Lab in Cambridge. Congratulations Arif! [Aug’17] Alzheimer's Association Research Grant (AARG) to the MPSC Lab. Congratulations folks! [Aug’17] IRLeak paper on Longitudinal Energy Waste Detection with Visualization accepted in ACM BuildSys 2017 conference. Congratulations Nilavra & David! [July’17] Submit your work to IEEE Transactions on Big Data Journal, Special Issue: Big Data in Ubiquitous Computing. Deadline Oct 15, 2017. [June’17] Congratulations Arif, Sajjad, & Hafiz for securing Summer Internship positions at the IBM Research, WalmartLabs, and GE Global Research. Great going guys! [May’17] Analyzing Social Media to Assess the Impact of Flash Floods in Cities accepted in IEEE SmartSys workshop with SmartComp 2017. Congratulations Bipen! [Mar’17] Collaborative and Opportunistic Activity Recognition paper accepted in IEEE DCOSS 2017 conference. Congratulations Hafiz! [Mar’17] Dr. Roy delivered a keynote talk on Wearable and IoT for Cognitive Health Assessment: Significance and Challenges at IEEE WristSense 2017 Workshop. [Feb’17] Unseen Activity Recognition paper using Active Transfer Learning accepted in IEEE ICDCS 2017 conference. Congratulations Arif! [Jan’17] 6 papers (Gunshot detection, SenseBox to Sports Assessment) accepted in PerCom workshops! Congratulations to Arif, David, Hafiz, Joseph, and Sajjad. Well done! [Jan’17] Congratulations to MPSC PhD student Arif for working on Intel Virtual Reality project as part his internship which has been showcased recently at CES 2017. See the full video released here. [Nov’16] Dr. Roy & Dr. Karabatis discussed smart energy & health research to Glenelg Country High School students in Maryland. See the pictures here. [August'16] Congratulations Arif for successfully defending the PhD proposal! [August'16] Behavioral Abnormality Detection paper accepted in the Annual Wireless Health Conference (WH'16) of the IEEE Engineering in Medicine and Biology Society. Congratulations Arif. [August'16] Congratulations to Sajjad, Nilavra & Arif for their internships in AgeWell Biometrics, IBM Research Smarter Cities Technology Center, and Intel. [July’16] Dr. Roy delivered an invited talk on “Wearable and IoT for Cognitive Health Assessment” at 2016 Alzheimer’s Association International Conference (AAIC’16) in Toronto. [June’16] Dr. Roy presented Multi-Inhabitant Activity Recognition work at IEEE ICDCS 2016 conference in Nara, Japan. [May’16] Dr. Roy co-organized the First IEEE workshop on Smart Service Systems (SmartSys'16) in conjunction with IEEE SmartComp 2016. [April’16] Dr. Roy and Dr. Galik presented their work on Technological Innovations for Alzheimer’s Research at UMBC President’s Board meeting. [March’16] AARP Foundation visited MPSC Lab. [March’16] MPSC PhD student Nilavra and Dr. Roy presented Quantum Machine Learning work for Big Data Cyber-Security Analytics at USNA-UMBC Partnership Symposium. [March’16] Multi-Inhabitant Activity Recognition paper in ICDCS 2016 and Behavioral Health Assessment paper in CHASE 2016 conference. Congratulations Arif! [Jan’16] Dr. Roy gave talk on “May I live Independently with IoT and Machine Learning” at Indian Statistical Institute (ISI) and TCS Innovation Research Lab in Kolkata, India. [Dec'15] Dr. Roy is invited as a Keynote Speaker at IEEE International Conference on Computing Technologies and Intelligent Data Engineering (ICCTIDE 2016) in India. [Nov'15] Papers on activity recognition in IEEE PerCom 2016 and IEEE Infocom 2016. Congrtulations Sajjad and Hafiz! [Sept'15] New paper on Iterative Signal Separation Assisted Energy Disaggregation at IGSC 2015 conference. Congratulations Nilavra! [August'15] NSF I-Corps grant on Developing Sensor Technology Box for Smart Health. [July'15] NSF CPS grant on Low-cost Continuous Virtual Energy Audits in Cyber-Physical Building Envelope. [May'15] Two papers (Real-time Activity Recognition, and Infrastructure-less Occupancy Detection) accepted at MobiQuitous 2015. Congratulations Arif and Hafiz! [April'15] Our new Lab Homepage has been launched! Take a minute to check out all the project details! [March'15] Dr. Roy has been invited to give a keynote talk on Green Building Energy Analytics at PerEnergy 2015. [March'15] 3 papers (Sleep Well, Opportunistic Sensing and Energy Analytics) accepted at IEEE MDM 2015. Congratulations Sajjad, Hafiz, and Nilavra! [Dec'14] Dr. Roy is a keynote speaker on Green Building Energy Analytics at ICECCS 2014, NITK Surathkal, Mangalore. [Nov'14] Nilavra's paper on Energy Disaggregation at IEEE PerCom 2015. Congratulations Nilavra! [Sept'14] MPSC PhD student Arif's paper on Gestural Health at IEEE SmartComp 2014. Congratulations Arif! [July'14] Dr. Roy's research on smart home health is in the Wall Street Journal. See the WSJ article on Using Sensor Technology to Lower Elder Care Costs. [6/24] Prof. Archan Misra from Singapore Management University visited MPSC and delivered a talk on Mobile Analytics. [6/1] Dr. Roy is named as UMBC 2014 Summer Faculty Fellow. [4/28] Two papers on Smart Health at ICOST 2014 conference. [3/27] UMBC News on Constellation Energy Education. [11/19] CNBC News on our Constellation project, exploring new ways of reducing power demand in household appliances. See several other press releases at Campus Technology News; Yahoo Finance; Electric Energy Online; Broadwayworld; Business Wire; Market Watch News etc. [11/19] Our Energy Education through Green Building project got funded by Constellation Energy. See the press release here. [11/11] Dr. Roy and MPSC student Joseph Taylor travelled to Rome to present their research paper and demo at ACM BuildSys 2013 conference. [11/5] IIT Kharagpur Prof. Niloy Ganguly visited MPSC and gave a seminar on Topical Search in Twitter. [10/31] Dr. Roy presented his research on green building energy management and sustainability to Constellation Energy executives at UMBC. [10/22] Deloitte delegates visit MPSC to know more about smart home healthcare research. [10/15] MPSC lab received the Smart Home in a Box (SHiB) kit from CASAS Lab at Washington State University. A smart home testbed has been built in a 2-bedroom 2-bath 1100 sqft apartment with 4 residents at Ellicott City in Maryland. [10/2] Undergraduate student Vignesh Ramachandran presented his poster on “Determining Power Consumption of Consumer Appliances Using NILM” at ACM Grace Hopper 2013 Conference in Minneapolis. [9/29]: “Demo Abstract: Performance of the Latest Generation Powerline Networking for Green Building Applications” accepted as demo paper in ACM BuildSys 2013. [9/29] MPSC undergraduate student Joseph Taylor has been awarded ACM SenSys NSF Travel Award. Congrats Joseph! [9/13] “Performance of the Latest Generation Powerline Networking for Green Building Applications” accepted as a full paper in ACM BuildSys 2013 conference. [8/25] Undergraduate student Vignesh Ramachandran has been awarded full conference travel award to present a poster on Green Building project at ACM Grace Hopper 2013 Conference. Congrats Vignesh! [8/13] NSF CSR Grant $258K at UMBC on project "Design and Implementation of a Fine-Grained Appliance Energy Profiling System for Green Building". [8/13] "Undergrad researchers succeed with the smart plug work". [8/13] "Movement sensor's feedback acts as physical therapist". [7/13] News about the Smart Enviornments NSF REU program. Check out the media release on "WSU Smart Environments Summer REU Explores Green Living and Healthcare Applications". 6/13: I'm editing a Special Issue on "Data Mining in Pervasive Environments" in Elsevier Pervasive and Mobile Computing (PMC) Journal. Please submit your work to this PMC SI. 5/13: I'll be joining the Department of Information Systems at University of Maryland Baltimore County (UMBC) as an Assistant Professor starting from Fall 2013. I'm looking for prospective PhD students to join in my group. 5/13: Invited to give a talk at the Indian Institute of Technology (IIT), Kharagpur on "Quality- and Energy-Sensitive Determination of Multiple Contexts in Pervasive Computing Environments" in May 2013. 3/13: Invited to give a talk at the Rochester Institute Technology (RIT) on "Quality Adaptive Models and Middleware for Situation Recognition in Pervasive Healthcare: Data Analytics Tools and Techniques" in March 2013. 3/13: Invited to give a talk at the University of Maryland at Baltimore County (UMBC) on "Quality- and Energy-Sensitive Determination of Multiple Contexts in Pervasive Computing Environments" in March 2013. 2/13: Invited to give a talk at the Colorado School of Mines (CSM) on "Quality- and Energy-Sensitive Determination of Multiple Contexts in Pervasive Computing Environments" in February 2013. 2/13: Invited to give a talk at the University of North Carolina at Charlotte (UNCC) on "Quality Adaptive Models and Middleware for Situation Recognition in Pervasive Healthcare: Data Analytics Tools and Techniques" in February 2013. 1/13: I'm heading up 2013 Summer REU program in Smart Environments at WSU. Please check the REU program website for more details. 12/12: N. Roy, A. Misra, D. Cook "Infrastructure-Assisted Smartphone-based ADL Recognition in Multi-Inhabitant Smart Environments", 11th IEEE International Conference on Pervasive Computing and Communications (PerCom 2013), acceptance ratio: 19 full papers out of 170 submissions = 11%. I am personally responsible for any content and opinion posted on this homepage. The University of Maryland Baltimore County is not responsible for any contents found on this homepage or any opinion expressed herein.